For any DIY papercraft project, you will need a few simple tools to turn card into an eye-popping low poly sculpture. Here is my shortlist of the vital tools no 3D papercraft builder should be without. They are all easy to source from stationery, DIY or craft shops. 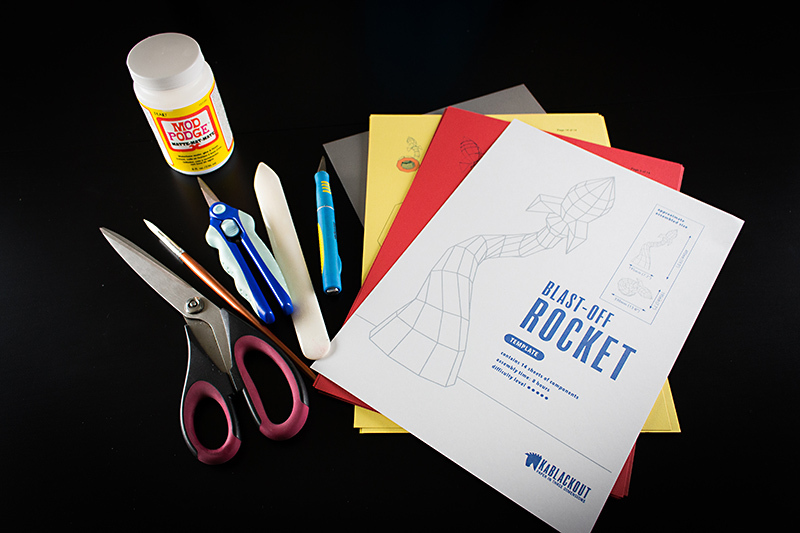 You’ll need something to cut out the parts from the printable template. Everyone has at least one pair of scissors somewhere in their house. Real papercrafters might have a pair for every day of the week! You don’t need anything too fancy at first, I began with a basic pair of kitchen scissors and you can too, but they need to be clean and sharp. After a while when I started working on more ambitious projects, I invested in specialist craft scissors. These are smaller and very useful for small detailed cutting jobs. I still use a larger kitchen-type pair to make rough cuts, but then use the craft scissors for finer work. No matter how nice your scissors are sometimes you need to make a cut where scissors can’t reach. That’s time to bring out a sharp knife. And I mean sharp. Forget about anything from the cutlery box, or that penknife that’s been at the bottom of the sock drawer since you won it at the fair when you were eleven. There are all sorts of suitable knives available form craft shops and DIY stores. Common types come as a disposable blade attached to a plastic or metal handle. When the blade gets blunt, you just remove it, carefully dispose of it and clip on a new one. Papercrafting is a pastime that needs you to do a lot of cutting and scoring. That is going to be hard on your table top. A cutting mat of some kind is essential to protect your workbench or dining room table. Traditionally these were stiff boards made from wood or a tough plastic and this older type is still available to today as “hard surface” mats. Personally I prefer the more modern “self healing” kind, this a fairly thin mat cleverly designed in flexible vinyl so any thin cuts you make in the mat surface reclose afterwards. Both varieties usually have a grid printed on them to make measuring and aligning tasks easier. Every papercrafter’s life goes through two stages. There is the early “cut it out, make a few folds, slap on some glue, cross fingers and hope it comes out OK” stage and then there is the day you get your first bonefolder. Suddenly you sit taller and straighter at your crafting table. Now you’re a papercraft force to be reckoned with. No papercraft will be too hard for you! If you haven’t levelled up like this yet, a bone folder is an indispensable tool for making a nice crisp crease in paper or card. It’s basically a flat and smooth stick which you run along the fold while applying a little firm pressure. Once you use one for the first time you’ll wonder how you ever did without it. Bone folders made from animal bone, plastic and Teflon are available. Once you’ve cut out the template and folded all the parts, you are usually going to want to stick them together and most people will use glue for this. We’ll talk about glues another time, but now assume you’ve using a PVA glue like I do. Do not, I say again, do not, squeeze glue straight from the bottle on to the tabs on the parts. Instead use a small “detail” paint brush to lightly spread just enough glue along the tab. Once you are done remember to wash the brush really well or you be looking for another. I also find the brush essential to reach and press on hard to get at internal bits of the sculpture I’m working on, remember to use the blunt end and not the hairy end. There you have it, these are my choice of essential tools for making your papercraft creation. Always, for safety’s sake, use and store them carefully. If you have any recommendations of your own I’d love to hear from you in the comments section. Until the next time, stay crafty! Previous PostPrevious Bone Folder – What Is A Bone Folder and How Do I Use It? Papercraft Templates: Ingenious and Alternative Ways To Use Them! Bone Folder – What Is A Bone Folder and How Do I Use It? Welcome to Kablackout. 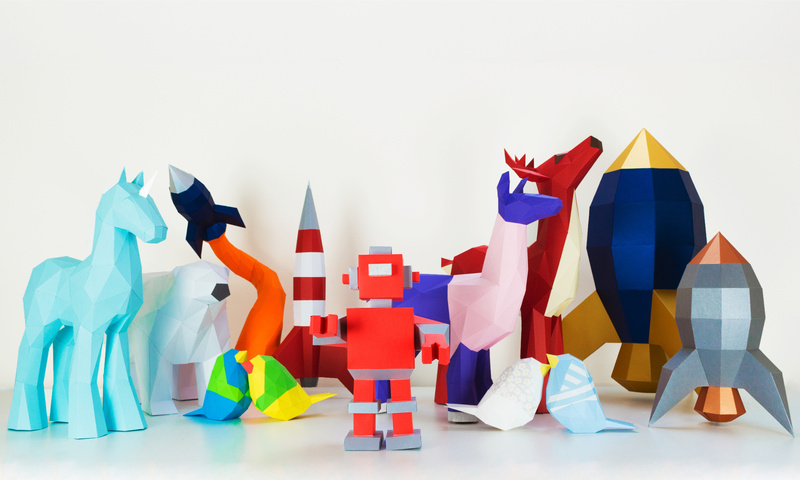 We make low poly 3D papercraft templates for others to turn into amazing art - it's paper magic! Have a quick question? Click here to drop us a message! ​We’ll respond as soon as we can!